so i went to the wiki thing and looked up sound. see the top left window? it clearly shows i am on frame 13.
so why does the green sound bar say 326? sure enough fast forward to 326 and i hear the sound. how do i get it to actually sound on frame 13.
drag it? to where - it already is on frame 13 ! The sound starts on frame 326 and goes for 30 frames. have already elapsed, not the current frame. Just zoom the top-right window out then drag the clip left until the number on the left that reads 326, reads 13.
next time can i tell it which frame to come in to? when i alt a it make the sound. Blender currently isn’t able to interlace audio into renders; you have to mix it with an outside program (VirtualDub, Audacity? ), although you can I think produce an audio file with the right amount of silence, and splice it with outher sound strips with the mixdown button. This make it easier to line up the audio and video when you combine them later. 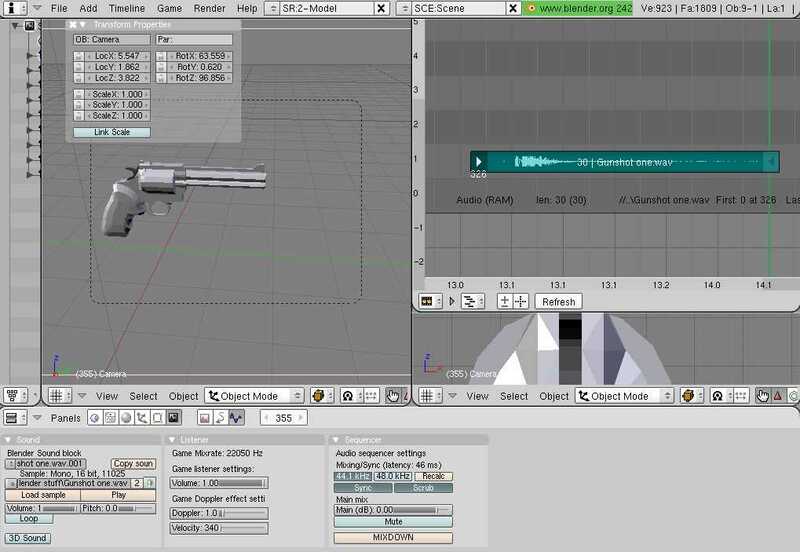 why have sound in blender if it does not…sound? Well, it allows you to make a sound track with multiple audio clips and line up your sounds with your animation. They are also used in the Game Engine a lot.